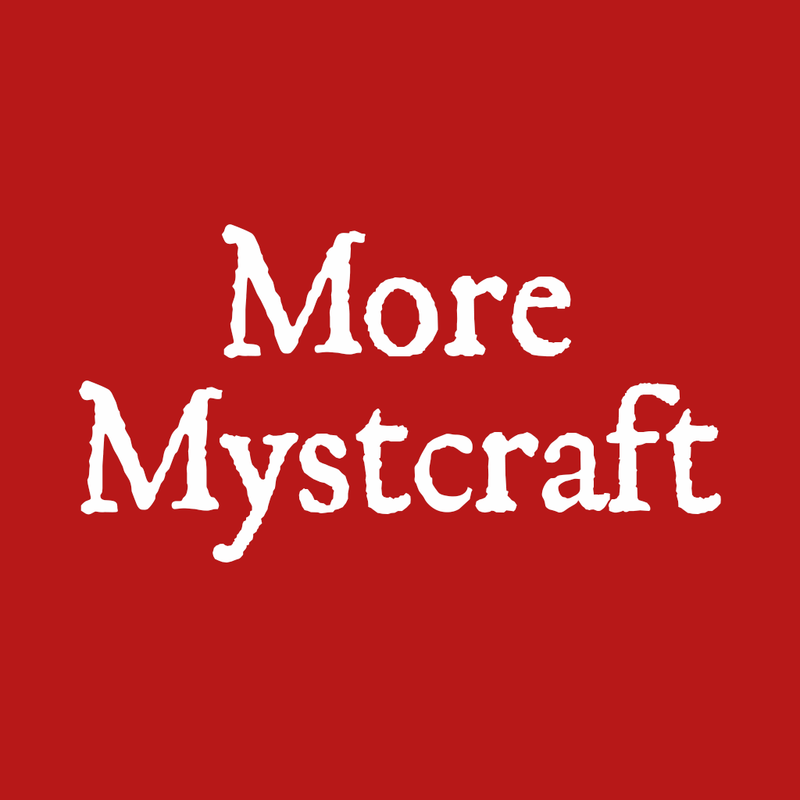 More Mystcraft is a collection of miscellaneous additions to the mod Mystcraft. Version 0.5.5 is designed for use with Mystcraft 0.13.7.03. It will not work with previous versions. Adds an overworld structure called the Abandoned Study that is meant to provide some resources to players who have not yet traveled to any Ages. It can also spawn in Ages if the corresponding Page is used. There is a config option to disable the Book Binder recipe if you would like these Studies to be the only source of Descriptive Books. Cosmetically upgrades the default libraries and provides an option to disable libraries altogether. If the upgrade is enabled, there is a 10% chance that a library will be upgraded to a larger Great Library. Pyramids: Features like Spheres and Spikes that accept blocks as modifiers. Ocean Monuments: Have ocean monuments spawn in your Ages! Size Pages: Tiny, Small, Medium, Large, and Huge. Tilt Pages: No Tilt (0°), Half Tilt (45°), and Full Tilt (90°). Tinted Sun Page: Make your sun a different color and give it a size and tilt for a truly unique Age! Rings Biome Distribution: A new biome distribution where the biome changes as you move outward from the center of the map. Normal Biome Distribution: Replaces the five "sized" biome distribution from Mystcraft and can be used with the Size pages. The original pages can be disabled and remapped in moremystcraft.cfg. East-West and North-South Bands Distribution: Biomes bands expand into infinity. Boxes Biome Distribution: Just like Rings Biome DIstribution, but with right angles. Island Biome Distribution: Accepts one biome page and places it in the middle of an infinite ocean. Use in conjunction with a Standard World page for best results. Gigantic Trees: A semi-replacement for Huge Trees. These ones have thicker trunks but spawn less frequently to cause less generation lag. Cloud Height Pages: Manipulate the cloud height in your Ages. Traffic cone: Ensure explorers stay within DRC-approved areas! Unstable Book Receptacle: Functions similarly to a regular Book Receptacle. When a Descriptive Book is inserted, it creates a new Age every time you use the portal. When a Linking Book is inserted, it spawns you at a random coordinate within the target Age. Be sure to check out these other great Mystcraft add-ons: Linking Through the Ages, Pages, linking-tweaks, and mystcraft-info. So I love Mystcraft and I've decided to try that addon, but whenever I start a new age (randomly, because YOLO!) I get stuck forever, getting the "waiting for chunk" thing. Any idea what's going on? I would need to see the latest log (not crash report) from your logs folder ttosee what's going on. Preferably posted using pastebin or equivalent service. I'll try again and send you that. Just in case, it doesn't actually crash. Edit: Well then, it's working perfectly fine now! I guess that was just an issue related to a particularly heavy world. My bad. Hmm yes that might happen sometimes. If it becomes a problem again, I'll be happy to look at a log to better diagnosis it. Thanks! Also, are you open for suggestions? I can think of a few ideas. I am open to suggestions. It's never a sure thing when I'll get to them, but I do keep a list. It is best if you use the Issues link at the top of the page (https://github.com/TheFloydman/More-Mystcraft/issues) and make a post as a suggestion. You can also join the Mystcraft Discord (https://discord.gg/pRGH45W), where there's a channel for every 1.12 Mystcraft add-on including this one, for more informal help. I'll join the Discord later! The thing I'd like to see the most is closer to a fix than an actual new feature... I was wondering if there was a chance you'd to allow the ink mixer to accept fluid pipes (from mods like Buildcraft)? This can be done with the writing desk already and it's very convenient with black ink oceans, so that would be a welcome addition. Unfortunately I cannot edit the behavior of any blocks added by Mystcraft. I could add my own ink mixer at some point, but I know XCompWiz knows that people want more piped fluid support. If that's in the works, fine by me! UPDATE: Made an edit to the github post I made. Is the Tinted Sun page a Feature or a Modifier? It is a feature and is separate from Mystcraft's sun pages. It accepts all the same modifiers, plus color, size, and tilt. Cool! Do you think you can add support for modded ores like RFTools? That should be easy enough, but I would probably do it as a separate mod to avoid bloat. Support for rftools and more is coming very soon. If you have specific blocks in mind, you can make requests or edit the CSV file on GitHub yourself.